This thread is as soft and shiny as satin. It glides through fabric and brings an exceptional sheen to all stitchery projects. 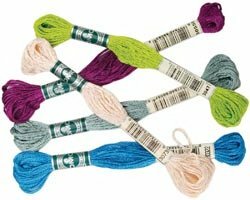 Available in 36 striking colors that follow the same numbering system as the original Rayon Floss. Each skein is packaged with new see-through label that keeps the thread tidy and makes it easier to use. Six-strand divisible thread on an 8.7 yard pull skein. Article 1008F.